This play off the 30 series (or curl series) is run off a pass to the corner with cutters. The play will be reset so that it can be run to the other side or another play in the series can be called. The post player on the side of the pass will move to the ball side short corner. The attack side post player will cut diagonally to the ball side elbow to set the initial screen. In this example, (5) will move to the short corner. If the play started with a pass to (3), (4) would move to the short corner. (1) will pass to (2) who will pass to (5). Immediately after the ball goes to the corner, (4) will step out and set a screen for (2) who will cut to the basket. If (2) does not receive the pass, he will move to the weak side block. (1) will set a screen for (3) who will cut to the basket looking for a pass from (5). (3) should also be alert for (2) being open, if (2)'s man helps on (3). (4) will move to the point. If (3) does not receive the pass, he will move to the ball side wing. If (5) does not hit (3) on the cut, he will reverse the ball to (1) through (3) and (4). 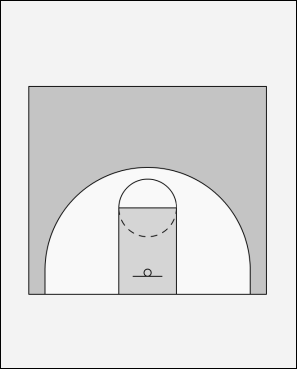 (2) will set a back screen for (4) cutting to the basket. (1) will attempt to hit (4) on the cut. (4) must look for (5) if (5)'s man steps in. (5) must be alert for the pass. (5) must be looking to step in. (2) will step to the point after setting the back screen. If (4) does not receive the pass, he will move to the low block on ball side. (4) will move to the ball side corner, since he is the closest post player to the ball. (5) will cut diagonally to the ball side elbow to set the initial screen. The play is now ready to be started again to the other side. If another play in the 30 series is called, (1) will reverse the ball to (2) and (5) will move back to the short corner. Immediately after the ball goes to the corner, (5) will step out and set a screen for (1) who will cut to the basket. If (1) does not receive the pass, he will move to the weak side block. (2) will set a screen for (3) who will cut to the basket looking for a pass from (4). (3) should also be alert for (1) being open, if (1)'s man helps on (3). (5) will move to the point. If (4) does not hit (3) on the cut, he will reverse the ball to (2) through (3) and (5). (1) will set a back screen for (5) cutting to the basket. (2) will attempt to hit (5) on the cut. (5) must look for (4) if (4)'s man steps in. (4) must be alert for the pass. (4) must be looking to step in. (1) will step to the point after setting the back screen. If (5) does not receive the pass, he will move to the low block on ball side. The play can continue with (5) cutting to the ball side short corner, since he is the closest post player to the ball. Or another play in the 30 series can be called in which case (2) will reverse the ball to (1).